Please do this consultation and help us to stop a tidal barrier effecting the life of the Mersey Estuary. It will only take a few minutes to complete but could save the estuary and the lives of tens of thousands of waterfowl, shorebirds and other plants and wildlife that exist or in part use the estuary in their everyday lives. You can cut and paste or utilise these comments if you wish. I do not want to see the Mersey Estuary used to generate tidal power. A barrage or anything that will interfere with the normal tidal flow of the Mersey will limit the spatial or temporal availability of the mudflats. This will have a devastating effect on the internationally important birdlife. The Mersey estuary is the best site in the UK for overwintering dunlin and moulting shelduck. Both species would be adversely affected by a tidal barrage. A little saunter down to the marsh after work and to check on what’s happening on No.6 tank. The construction of the 14th wind turbine is almost complete over on No.4 tank with another five more to go. Back to the birding and the water on No.6 tank is finally dropping to a level to encourage waders back and a group of 19 Dunlin including the first juvenile bird, 4 Ruff and 56 Black-tailed Godwits is very promising for the next few weeks (fingers crossed). There were many ducks on the open water with c65 Tufted Duck, 49 Gadwall, 61 Mallard, 12 Shoveler, 23 Common Teal and an assortment of Common Shelduck and their young. A female Marsh Harrier was hunting the south vegetated areas of the tank and looked very much like a Red Kite with its central tail feathers missing. A party of 5 Yellow Wagtail flew over while one or two juvenile Reed Warbler could still be found in the reed beds below the track. On leaving the area a group of 100 Common Swift dropped in to feed over the fields. A view of Trinity Church and Fox Hill beyond. Observers: Emily Traynor, WSM (and images). It’s been a river of two halves recently with the good ship ‘Hale and Hearty’ sailing away with all the bird bounty comparing, Unfortunately our leaky old tub the ‘Mary Celeste’ is ploughing a lone furrow and in need of a life buoy. Anyway enough of mixed metaphors. I just managed to get my WeBS count in after working this weekend. I was also hoping in vain that the ‘ibis’ might find its way to this side of the water during the high tide, but it’s taste is presently favoured to the north side. All said and done there was little in the surprise department far as new birds were concerned. I have listed the species worthy of note below. A female Marsh Harrier was sat on the fence post bordering the track on No.5 tank but all I managed to see was through the cars rear view mirror before it flipped over the bank. It did reappear later quartering the fields of the tank. 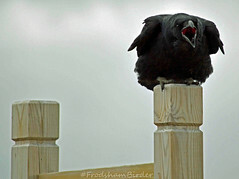 There were quite a few Raven loafing about on both No.5 and over on Frodsham Score. A flyover Yellow Wagtail is typical of their performance this summer and to be honest they’ve not been that regular this summer. The main aim of my visit was to record the number of waterfowl on both No.6 and the mitigation area on No.3 tanks. A drake Wigeon was on No.3 tank with a few Gadwall and 20 Greylag Goose. Another Wigeon flew in and disappeared into the vegetation on the far side of six. The commonest bird on the water was Tufted Duck which were gathered closely on the eastern side of the tank and thus easy to count the 243 birds, with the tufties were just 3 Common Pochard. Common Shelduck adults were surprisingly scarce and those here were keeping an eye on the 50 youngsters feverishly feeding up. Gadwall and Mallard both mustered 32 and 54 respectively while Common Teal reached a good 43 birds. A small gathering of Canada Goose were in the flooded daisy beds with the rest out on the Mersey estuary no doubt. There were just 3 Mute Swan today along with an adult and juvenile Great Crest Grebe and 4 Little Grebe out in the open. Shorebirds were thin on the ground with just a single Ringed Plover and 6 Common Snipe. A big barrel chested Peregrine sat out on the blue-topped chimney (pictured above) and watched all the comings and goings on out on the big river. The skies above No.5 tank were alive with 500 Common Swift feeding above the tree line. I’d rather face a Notch-horned Cleg armed to its teeth (or stylets) than have to run the gauntlet of a surreptitious ambush from the mighty marsh midges (Culicoides impunctatus). My arms are covered with (their nettle sting like) bites and I can’t even say it was worth the effort birding here this evening! All the same and for what it’s worth the usual Tufted Duck/Common Pochard combo were again present on the waters of No.6 tank. Likewise, Common Shelduck parents were still fostering an excess of surrogate chicks with shelducklings in a variety of age creches. A Little Grebe gave some good views as it sat preening on the waters below the banks from where I was watching. The nettle and thistle smothered mitigation site had a small group of 8 Greylag Goose, 10 Gadwall, an adult and juvenile Little Ringed Plover. There was only 11 Raven moving out from Frodsham Score at dusk. The sounds of Reed and Sedge Warbler are diminishing daily as summer slowly nears its peak. A Yellow Wagtail called from nearby. There were a few leftover flying ants about which kept the high-flying Swift, Swallow and House Martin up in the evening sky. Observer and images (except image 2): WSM. The temperature was reading 31.5 degrees and it was a warm and sultry evening walk on the mean tracks of No.5 tank. It is difficult knowing where to kick off this post but it’s always a safe bet to begin with ducks. Tufted Duck were numbering 149 birds with 12 Common Pochard, 34 Gadwall, 3 Shoveler, 8 Common Teal and loads of Shelduck and their youngsters. A Green Sandpiper was calling unseen from the banks below where I was standing but it didn’t break cover. Apart from a couple of Curlew, a flock of Lapwing, the sandpiper was the only decent wader present. Well that was it really, except for a loose flight of 71 Raven heading south from Frodsham Score. A few images of the wildlife-filled drainage channel bordering Moorditch Lane. Moorditch Lane track is one of the oldest thoroughfares on the marsh dating back to the Doomsday book. The lane was used in days of old to access the marshes at both Frodsham and Helsby. In more recent times (pre 1993) it was the main access route to the sludge pumping station. I could almost imagine hearing the song from the Isley Brothers 1974 version of Summer Breeze wafting through my mind as I walked out along the dusty track of No.5 tank. The weather was in glorious form, unfortunately a combination of heat haze, humidity and few birds more or less generated a pleasant summer walk in the breeze. Well, there were a few birds to keep us entertained not least the juvenile Cuckoo that popped up in the scattered Elder bushes on No.5 tank. A few singing Sedge Warbler were still holding territory whilst recently fledged birds from many different passerine species were emerging from trees, bushes, reed beds and grassy meadows. The mitigation on No.3 tank is basically a nettle bed with just a corner available for the intended species i.e Lapwing. A Ruff and a few Lapwing didn’t stay around for long with the steady turnover of people enjoying a walk around the marsh today. Unfortunately whenever the Lapwing flock resettled they were flushed again by the next group of people passing by. Out on No.6 tank the ducks present very much reflected the same species as yesterday along with a juvenile Great Crested Grebe was a healthy supply of parent and juvenile Dabchick. The begging calls of juvenile Common Buzzard chasing their parents high in the sky filled the air and one particular bird was attracting the unwelcomed attention of a Kestrel. A day of little activity from the birds and their “managed habitat” on No.3 tank and of course we birders. Observers: Tony Broome, Paul Ralston, WSM (video and images).